Wayne County Michigan New Home Construction, Island Estates by Nicholas Homes West, L.L.C. Welcome to Island Estates Subdivision located in the City of Gibraltar with the Gibraltar School District. Nicholas Homes West, L.L.C., your Wayne County Michigan new home construction specialist, has several spec homes under construction and available at Island Estates with occupancy dates varying from one month to ninety days. You may still able to choose some colors or flooring selections. Island Estates Subdivision is an intimate subdivision located a short walk from Humbug Marina, great for boating enthusiasts! The elementary school is located just across the street from the subdivision entrance with the high school and middle school just 5 minutes away. Please visit or call our sales model located in Cambridge Meadows Subdivision for details or to schedule a private showing; there is no sales office located in Island Estates. 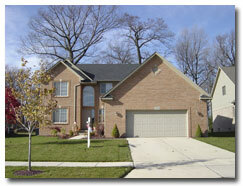 Island Estates is located off the north side of Gibraltar Rd., 1⁄4 mile east of Jefferson, just minutes from I-75.